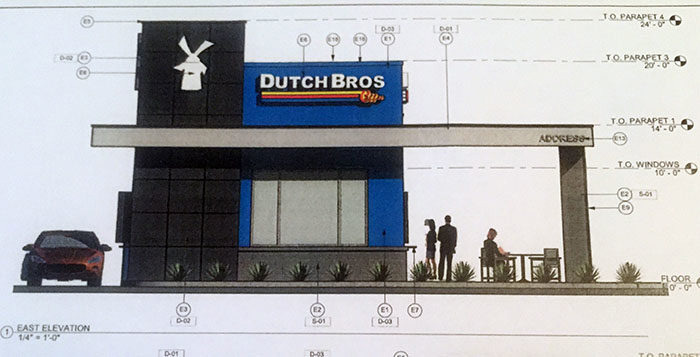 Dutch Bros. received a commercial permit for its 1,280-square-foot property at 20232 N. John Wayne Parkway, which includes a drive-thru and patio. Construction is expected to be under way in February. Maricopa Shell at 19680 N. John Wayne Parkway received a permit to re-install four new fuel dispensers at a value of $12,000. Sports & Cuts Barber Shop was permitted for a fire alarm system in newly constructed space at 41600 W. Smith-Enke Road, Building 14, Suite 2. In the same building, State Farm was given a city permit to use existing signs and move the signs from its old location. Red River Cattle LTD received permits for grading and drainage at the new site of Sacate Pellet Mill, 38743 W. Cowtown Road. Brakes Plus, being constructed at 20555 N. John Wayne Parkway next to IHOP, received an onsite-improvement permit. Heritage Charter had a hydrant flow test for its construction at Adams Way and Conner Drive in Desert Passage.